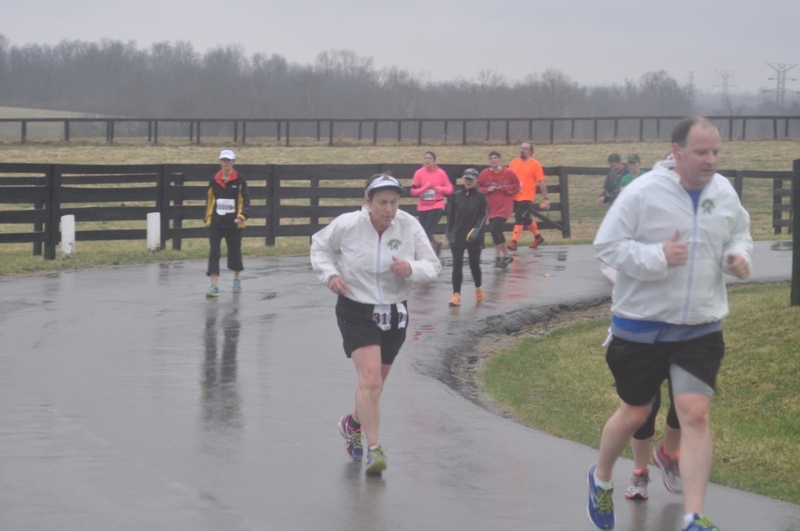 Rainy Run The Bluegrass | Run Todd Run! Wow, has the last month been busy. I have some catching up to do. I will start with our return to Keenland in Lexington for Run The Bluegrass 2014 version. Last year this race very near took us out. We had no idea what to expect, and the hills were brutal. However, it was such a beautiful race, I convinced, tricked, and cajoled Joyce into signing up again. We knew what to expect this year, and I was really looking forward to the race. 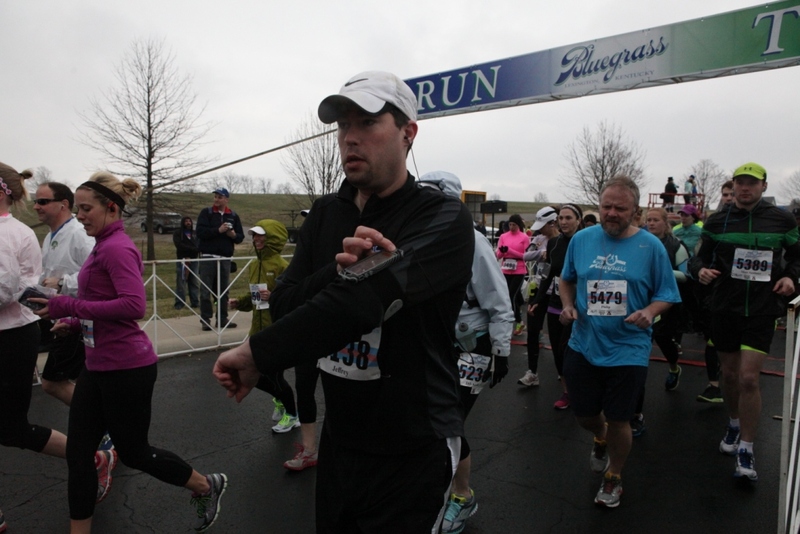 The organizers of this race are so enthusiastic and runner-centered, that it was hard not to be excited for this run. Last year, the key word was “hills.” This year, it was “rain,” which will explain the lack of pictures. There was a 100% chance of rain, and we knew it was coming all week. As a result, I did not carry a camera. Luckily the start was rain-free. Parking was much better than last year due to a lack of construction, and we made it in plenty of time to get a pre-race bathroom break. We found our wave and waited for the start. They spaced the waves 2-3 minutes apart, which really helped to space things out (unlike the Kentucky Derby Festival Mini – but that is for another post). This race has a great atmosphere. Let’s go! Do you see me? Cloudy and I’m wearing shades. Not for long! The start brought great running weather. There was a chill in the air, but we knew the rain was coming. 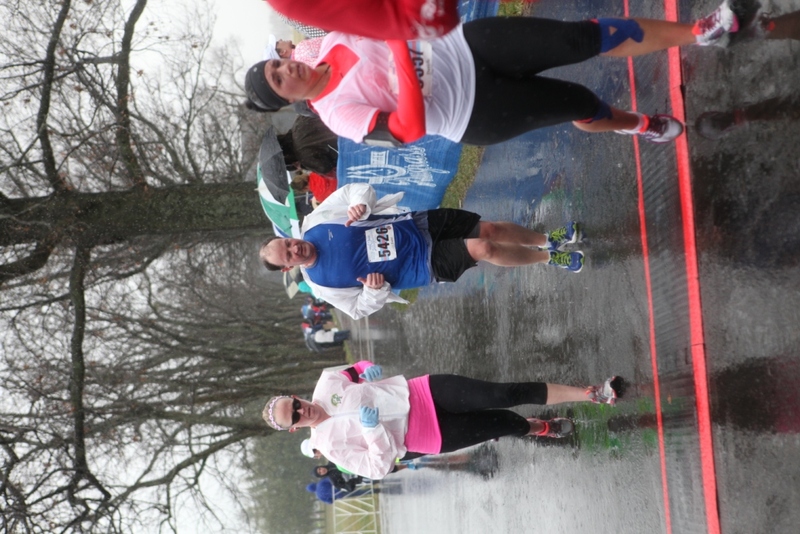 I bought a $10 rain jacket at the expo the day before, and it was a lifesaver for this race. 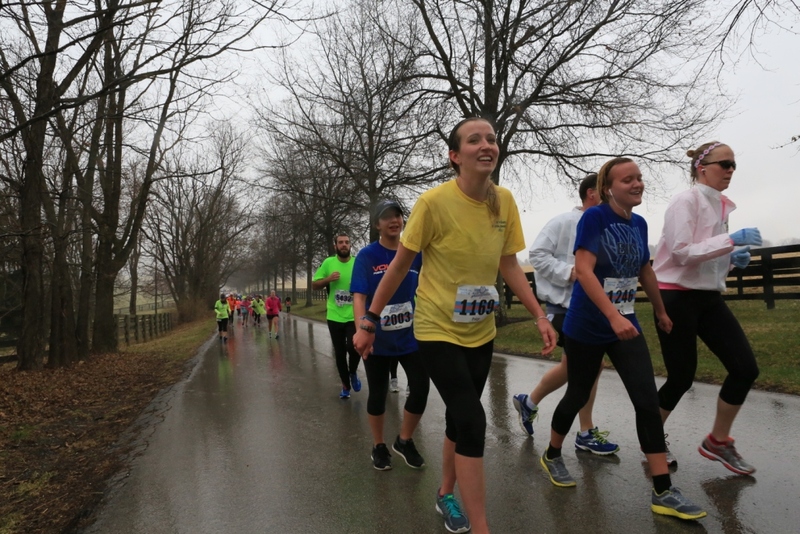 The first few miles were a bit tough, as Joyce’s legs just wouldn’t seem to loosen up. As we went along, the rain began, and continued to become more steady. Around mile 5 or 6, a little dog decided to join the race. He was fast! However, he was running away from where he lived. Our running buddy, Sarah, the consummate dog lover, actually stopped to call his family from the number on his collar. I half expected to have a new companion on the way home, or to see her cross the finish line with him (which I am sure she would have done had she not been able to contact his owners!). She successfully got the dog where he needed to be and rejoined us after the finish, sans dog. My personal goal in this race to to run the whole way up the hill/mountain/cliff at mile 9, no matter how badly it hurt. By that time, the rain was coming down pretty hard, but I was not going to be deterred. Up I ran. I must have passed two dozen runners, and it hurt, but I did it. I waited a few seconds at the top for Joyce, and we headed toward the finish. As we did, it began to pour. Mile 11, just before the beer stop. I forgot how hard the hills were in the last mile or two of this run. 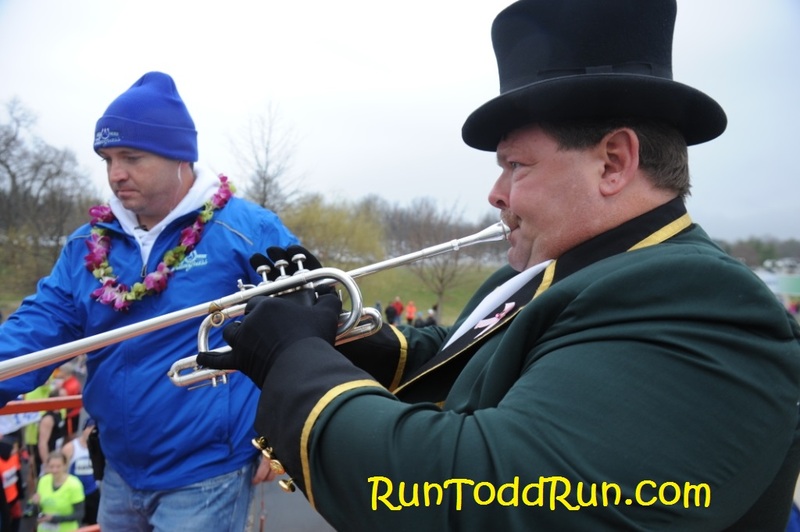 Last year we had to really change our intervals to make it through. This year, we tried to hustle through them as best we could. By about mile 12 my shoes we soaked and sloshing. I am surprised they stayed relatively dry that long. We persevered and made our way to the finish about 7 minutes ahead of last year, ‘s time, which is great considering the weather. Even with the rain, I loved the race. 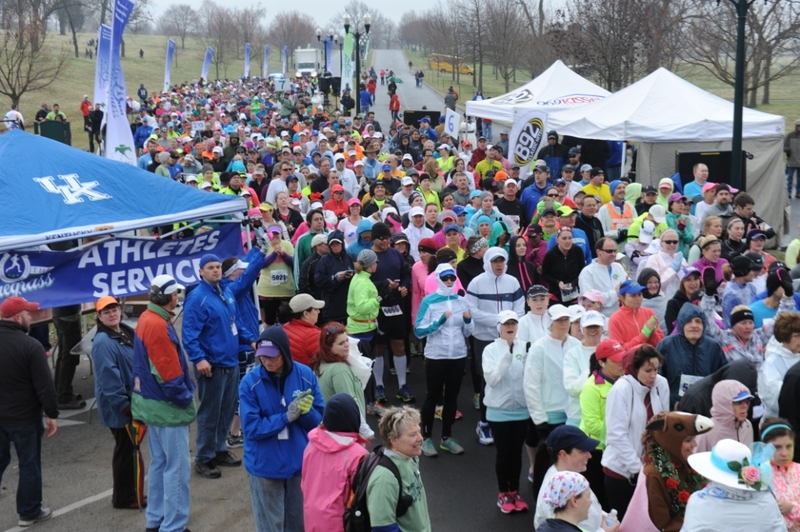 This is one of my favorite courses (much to Joyce’s chagrin), and the volunteers and race organizers are second to none, especially this year when they braved the elements to hand us water (and a selection of at least 3 other drinks – Sword, Nuun, and Gatorade – AWESOME!). The organizers had to scramble to re-arrange all the post-race festivities they had been planning for the last year, and they did a fantastic job. Puddles are larger than they appear. Hairline is just as it appears. 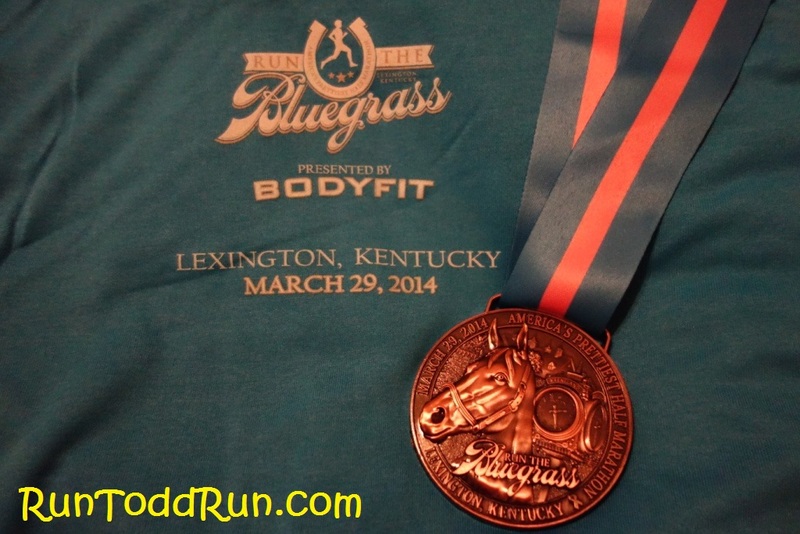 . .
Another Run The Bluegrass in the books. 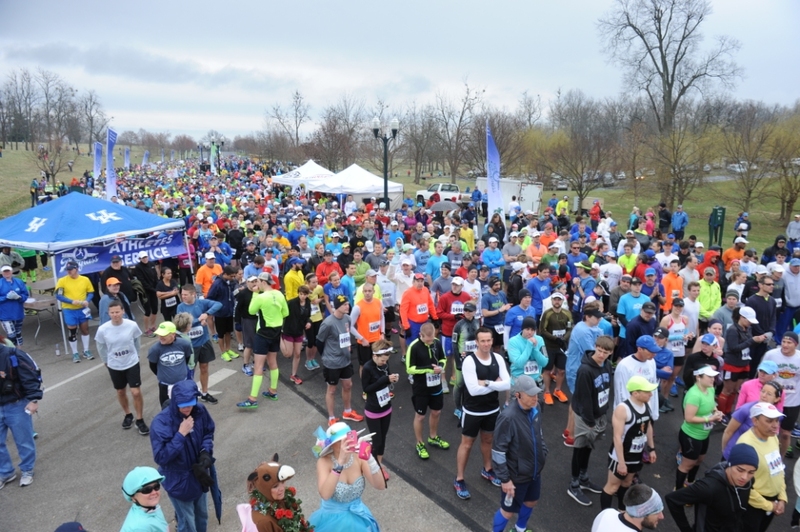 This year, RTB paired with the Kenucky Derby Festival Mini, to offer the inaugural Kentucky Half Classic Medal to those who completed both races. Of course, we were in. My next post will review the KDF Mini and the Half Classic medal, and I am going to try to take a little different slant on that one. Finally, if you can’t tell, I love this race. If ever get a chance to run it, do it. 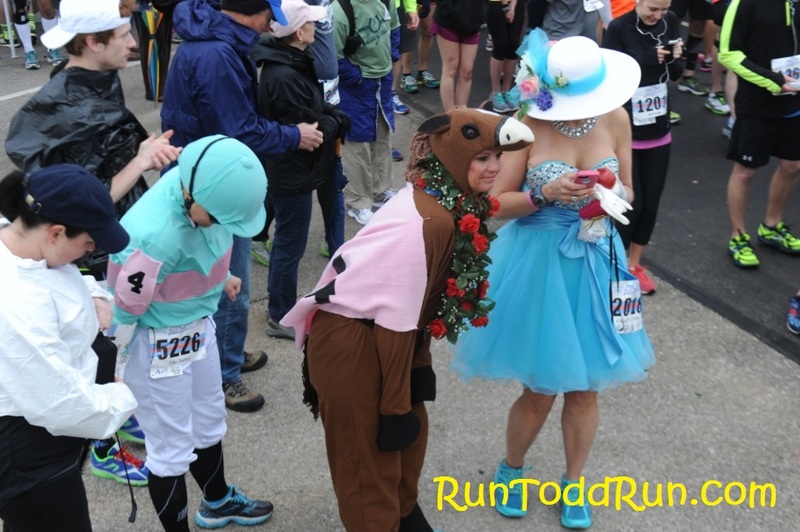 This entry was posted in Running and tagged Rainy Running, Run the Bluegrass on May 6, 2014 by jtspurge. WHAT ARE YOU DOING TO MY BABY?